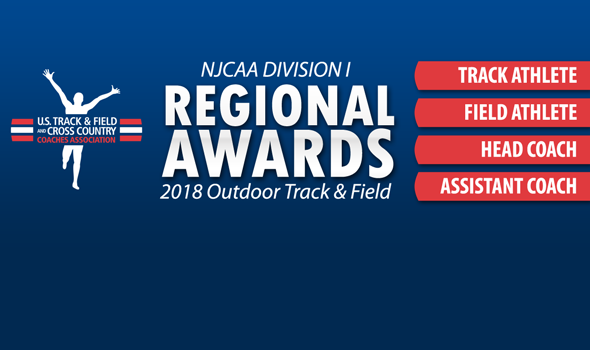 NEW ORLEANS — Regional Athletes and Coaches of the Year for the 2018 NJCAA Division I Outdoor Track & Field season were announced Wednesday by the U.S. Track & Field and Cross Country Coaches Association (USTFCCCA). Each of the five regions honored both genders’ top track athletes and field athletes, and the top men’s and women’s head coaches and assistant coaches. Award winners were determined by a vote of USTFCCCA member coaches. Only those individuals from USTFCCCA member programs are eligible for awards. Many of these athletes and coaches starred at the 2018 NJCAA Division I Outdoor Track & Field Championships this past weekend in El Dorado, Kansas. Williams, a freshman from Kingston, Jamaica, sits No. 2 in the nation in the 400 hurdles at 50.82 and No. 3 in the nation in the 110 hurdles (13.82w). He won an event title in the 400 hurdles earlier this season at the Miami Hurricane Invitational. Lyon, a sophomore from Fort Carson, Colorado, is ranked No. 1 nationally in the 100 at 10.00 and second nationally over 200 meters (20.49). His time in the 100 ranks third in Barton CC program history and he is undefeated in the 200 this season. Lyon scored 20.5 points at the Region VI Championships by himself. Ledesma, a sophomore from Morelia, Mexico, is ranked first nationally in the steeplechase at 8:55.26 and second nationally in both the 1500 at 3:52.19 and the 5000 at 14:33.55. He won an event title at the UVU Collegiate Invitational earlier this season. Holdsworth, a freshman from Williamsburg, Virginia, is ranked first nationally in both the 800 at 1:48.22 and the 1500 at 3:46.67. He posted his PR in the 1500 at the Bryan Clay Invitational and beat a number of NCAA Division I athletes in the process. Boyers, a freshman from Fort Defiance, Virginia, is ranked 12th nationally in the shot put at 15.51m (50-10¾) and 28th nationally in the discus at 41.32m (135-6). He has a pair of runner-up finishes to his name this outdoor season. Lawrence, a sophomore from Westmoreland, Jamaica, is ranked first nationally in the shot put at 18.20m (60-4) and second nationally in the discus at 53.69m (176-1). Just last week, he broke the Region VI record in the shot put as well as the facility record where the meet was held. Ejumeta, a sophomore from Nigeria, is ranked fifth nationally in the triple jump at 15.35m (50-4) and 10th nationally in the long jump at 7.40m (24-3½). He won regional titles in both the triple jump and the long jump. Edoki, a sophomore from Nigeria, is ranked first nationally in the long jump at 8.10m (26-7) and third nationally in the triple jump at 15.50m (50-10¼). His long jump PR doubles as the fourth best mark in NJCAA history. Marsee, in his first year at Vincennes (Ind. ), led the Trailblazers to the No. 1 ranking in the Atlantic Region and the No. 19 ranking in the nation. Vincennes (Ind.) will send 11 qualifiers to the NJCAA meet this weekend and the team won the Region XII team title. Schenek, in his 11th year at Barton (Kan.), led the Cougars to the No. 2 rank in the Central Region as well as the nation. Barton (Kan.) will send 42 qualifiers to the NJCAA meet, which includes 24 national top-10 performances. The Cougars also won the Region VI team title. Myers, in his ninth year at Iowa Central, led the Tritons to the No. 1 rank in the Midwest Region and the No. 4 rank nationally. Iowa Central qualified 29 entries for the NJCAA meet. The Tritons rolled to the Region XI team title as they had 12 event champions. Vance, in his second year at South Plains (Texas), led the Texans to the No. 1 rank in both the West Region and the nation. The Texans will send 51 qualifiers to the NJCAA meet, which include two of the top horizontal jumpers in the nation. Greene, in his ninth year at Monroe (N.Y.) coaching middle distances and long distances, has athletes ranked in the national top-10 of the 400, 800, 1500, steeplechase, 5000, 4×400 and 4×800. In addition to those marks, he has athletes ranked No. 1 in the Atlantic Region in the 400, 800, steeplechase and both relays. Henry, in his first year at Barton (Kan.) coaching hurdles, jumps and the program’s 400-meter runners, tutored the top-ranked male in both the 110 hurdles and the 400 hurdles. During the Region VI Championships, his athletes accounted for 86 of the Cougars’ 213 team points. Anderson, in his first year at Iowa Central coaching the sprints, hurdles and horizontal jumps, tutored two men who won three combined Region XI titles. Thomas Zor was the individual champion in the 400 hurdles, while Phemelo Matlhabe swept the 200 and 400. The Tritons’ 4×400 relay team also captured region glory. Hobbs, in his second year at South Plains (Texas) coaching sprints, hurdles and high jump, has three men ranked in the top-3 of both the 110 hurdles and 400 hurdles. Athletes he tutored have qualified in every event area in which he coaches, including two in the high jump. Foster, a sophomore from Guyana, ranks in the top five nationally in both the 800 Meters and the 1500 Meters. Her top times of 2:12.37 and 4:39.63 are also the top marks in the region in both events. Anderson, a sophomore from New York, has the third-best time nationally in the 100 Meters with a season-best of 11.61. She also ranks in the top 10 nationally in the 200 Meters with her best time of 23.84 and competes on Butler’s fourth-ranked 4×100 Relay. Cohen, a freshman from Jerusalem, Israel, leads NJCAA Division I in the 1500 Meters, Steeplechase, and 5000 Meters. Her top marks of 9:52.37 in the Steeplechase and 16:07.03 in the 5000 Meters also broke the Israeli national records in both events. She won Region XI titles in the 1500 Meters, 5000 Meters, and as a member of Iowa Central’s 4×800 Relay. Chambers, a sophomore from St. Elizabeth, Jamaica, ranks in the top two nationally in both the 100 Hurdles and the 400 Hurdles. Her top mark of 58.41 in the 400 Hurdles is the fastest in NJCAA Division I this season. Hooper, a sophomore from Guyana, has the best mark of the regular season in the triple jump at 13.34m (43-9¼). That mark also reset the Essex County school record in the event. Harris, a sophomore from Erial, New Jersey, leads NJCAA in the discus and ranks second in the hammer with best marks of 51.45m (168-9) and 51.90m (170-3) in those respective events. She won Kansas Relays titles in both throwing events and also ranks in the top ten nationally in the shot put. Roberts, a sophomore from Newton, Kansas, won Region XI Championships in both the shot put and discus and finished fourth in the hammer to earn 25 points in the throwing events. Her top effort of 14.92m (48-11½) in the shot put ranks fifth nationally in the event. Brown, a freshman from St. Catherine, Jamaica, recorded the third-best mark in NJCAA history in the shot put this season with a mark of 16.37m (53-8 ½) She won Region titles in the shot put, discus, and hammer and finished second in the javelin to earn 38 points in the throwing events. In addition to her top-ranked shot put mark, she also ranks in the top ten in the discus, hammer, and javelin. Marsee, in his first year at Vincennes (Ind. ), led the Trailblazers to the No. 1 rank in the Atlantic Region and the No. 12 rank nationally. Vincennes (Ind.) will send 11 qualifiers to the NJCAA meet. Schenek, in his 11th year at Barton (Kan.), led the Cougars to the No. 1 rank in the Central Region and the No. 5 rank nationally. Barton (Kan.) will send 28 qualifiers to the NJCAA meet after a strong performance at the Region VI Championships, where it won by 31 points. Myers, in his ninth year at Iowa Central, led the Tritons to the No. 1 rank in the Midwest Region and the No. 3 rank nationally. Iowa Central will send 40 qualifiers to the NJCAA meet after cruising to a win at the Region XI Championships. Blackwill, in his 13th year at New Mexico JC, led the Thunderbirds to the No. 1 rank in the West Region and the No. 1 rank nationally. New Mexico JC will send 22 qualifiers to the NJCAA meet, including top-ranked athletes in the 100, 4×100 and long jump. The Thunderbirds have quite a corps in the sprints as they have three athletes in the top-7 of the 100, three in the top-5 of the 200 and two in the top-6 of the 400. Greene, in his ninth year at Monroe (N.Y.) coaching middle distances and long distances, has athletes ranked in the national top-10 of the Descending Order List in the 400, 800, 1500, 4×400 and 4×800. His athletes are ranked in the top-3 of the Atlantic Region in each of those events as well. Adler, in his second year at Cowley (Kan.) coaching the distance runners, tutored his athletes to victories at the Region VI meet in the 5000, 10000, steeplechase and 4×800. His athletes are ranked in the top-15 nationally in each of those events as well. Burkholder, in his first year at Iowa Central coaching the throwers, tutored athletes who won three of the four throwing events at the Region XI Championships. His top-ranked athlete is Kirsten Leisinger in the hammer (fourth), followed by Payton Roberts in the shot put (fifth). Williams, in her seventh year at Western Texas, has athletes this season that has achieved 21 national qualifying marks. Her athletes led the nation in three events and the region in four events, including 13 top-ten national marks and 19 top-ten marks in the region. Abigail Kwarteng was named USTFCCCA National Athlete of the Week three time and set a national high jump record for Ghana, jumping 6-1½ (1.87m).